On January 15, Boston Children’s Chorus and Art Reach at Provincetown Art Association and Museum were honored at the MA State House for winning the National Arts and Humanities Youth Program Awards by the President’s Committee on the Arts and Humanities. 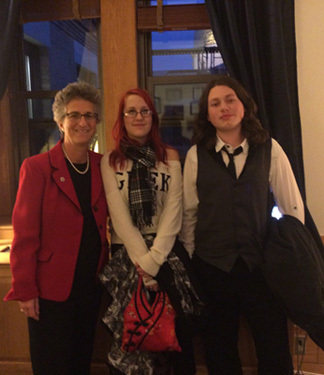 There, Cat Van Buren of Harwich, MA, spoke eloquently about the role an out-of-school arts program plays in her life. Cape Cod is just the small, flexing arm of Massachusetts and yet it holds a treasure trove of hidden talents, artists, and interests. Going to Art Reach allowed me to meet and befriend people I would not have met without this program “reaching” to us all. … It so surprising and comforting to know how many people on the Cape share my interests. I am so happy I can go to Art Reach every week and do what I love. Drawing is my outlet for my imagination. If I could not do that I have no clue what I would do! Art Reach allows me to practice my trade and be with people that share my interests. It is an escape for young artists! I think youth art programs are one of the most beneficial things that could be placed anywhere. Art Reach as one of them gives a creative and productive outlet to the students in it while allowing the feeling of social communion and acceptance. Art programs are a place to belong. It allows students to explore and express themselves in the world of art. With Art Reach I have definitely learned that art is what I want to do for my career. Learning about different materials and computer programs and utilizing them. I belong at Art Reach. There, I feel like nothing can get to me; everyone is just doing things they enjoy, swapping stories, and sharing techniques. It’s great. I am so glad I learned about Art Reach because without it I think I would just be bored, to put it plainly. Bored. Without Art Reach I think my life would be black and white, but with it there is color!